Family Charter Yacht Dolphin Dream. Scuba Dive and snorkeling in the Bahamas with The Dream Team. The Charter Yacht Dolphin Dream. We finally accomplished our dream of getting a newer, bigger, better and more comfortable boat. Our 25th year in business we are celebrating with our 3rd and best boat the DOLPHIN DREAM. Relative to group size we feel we have the best live aboard in the Bahamas. This new charter yacht has even surpassed even our expectations for ride comfort. We cannot guarantee you won't get seasick but we have seen a 90% decrease in seasickness on board. The DOLPHIN DREAM started out as a shrimp trawler called the "God's Will". Built and operated by the same family (Patti Shipyard, Pensacola FL), she was built to a higher standard than most shrimp trawlers. Eventually she was sold to a father son team that worked her in the Gulf of Mexico. They outfitted her with new engines and electronics in 1998. Then the price fell on shrimp and they lost her to the bank in 2003. We picked her up in Pensacola FL as a bank repossession for a relatively low price. We had spent ten years looking for a new vessel and never found anything we liked and could afford, within ten minutes after seeing this boat we new it was the right one. We asked the original family builders Patti Shipyard if they would help us with the conversion to a liveaboard dive charter yacht. They were initially skeptical about taking a conversion job considering they only build new vessels. They agreed to help us because they felt sentimental about the boat, the original name was "Our Mother" after the families grand mother. The conversion was designed, supervised and worked by Captain Scott Smith. The conversion included such things as changing the shrimp hold into cabins, adding a complete house on the aft of the vessel and adding a six feet extension dive platform. The conversion is 90% complete but it will take us a few years to finish all the details. 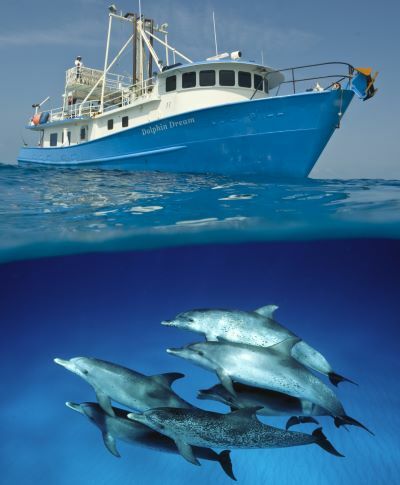 The "Dolphin Dream" is an 86' x 26' ocean expedition family charter yacht. She is designed to ride the sea in comfort, safety and style. One of our long time customers even said "she's more stable than the larger aggressor boats". Built and equipped well above any safety standards for the size vessel. She has twin engines that are only six years old. There are five spacious cabins with full size upper and lower bunk beds and one large cabin with a double bed, for a maximum of 12 clients. The salon and cabins are located aft of center line, the most comfortable place in a boat. The salon has four benches and four chairs surrounding two tables for dining. The galley and salon are separated by a serving counter. There is a drink bar with a refrigerator, ice maker, coffee pots and a sink. There is room for cameras on shelves with electric and below the benches. There is a 27 TV, DVD/VCR, stereo, book and video library. Three heads with showers, an outside shower and plenty of freshwater. The back deck has tables for cameras, fresh water rinse hose, aquarium, fishing equipment and the stairs to the upper deck. The large built in platform has the scuba tanks and benches. The water is just a short distance for entrance and a ladder to climb out on. There are big flood lights that shine into the water for night swims or dives. The upper deck has the dingy ( for rescues or shore excursions ), gear storage boxes, a sundeck for sunbathing, and a covered deck to stay out of the sun with plenty of space for dolphin watching. The large bow fore deck has plenty of space for dolphin watching. Life on board is informal and relaxing, comfortable and clean. While enjoying your solitude, you will encounter a stress free atmosphere where dressing down is encouraged and world news is only in the back of your mind. The days are spent experiencing nature and our nights are spent anchored under the stars. We avoid the tourist traps unless requested. Meals onboard include outstanding home-style cooking. Breakfast, lunch, and dinner are prepared fresh, while snacks including fruit, nuts, and sweets are always available. Just think... you're on vacation, you don't even have to do dishes. Refreshments such as ice water, juices, coffee, hot and cold tea, and lemonade are included. Notify us ahead of time and we can accommodate any special dietary needs. The vessel is manned by two licensed captains, a cook and a mate all trained to give the safest and funnest service. Safety is our number one priority, particularly when your in the water. At all times there are two crew on the boat watching, in case anybody has a problem while swimming. There is always one crew in the water with you while swimming. Join us on board for fun in the sun! Captain Scott Smith, his wife Captain Robin Sabino, Captain Andy Pickrell and Gale Garland as cook. Scott's mother Inez Smith runs the office and does all the booking. Captain Scott Smith has been interacting with and recording the behaviors of the Atlantic Spotted dolphin on the Little Bahama Bank since 1980. As captain of the charter/research vessel, Dolphin Dream, he spends over 30 weeks a year in the Bahamas with his dolphin friends. Scott first encountered wild dolphins as a boy while fishing with his father in the Indian River near Cape Canaveral. Bottlenose dolphin would play in the boat's wake and often accompany them into the night. This began a life-long passion for the sea and its inhabitants. 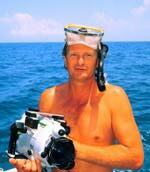 As a teenager, Scott began working with his family in their liveaboard dive boat business. It was during this time he first swam with the friendly and curious Spotted dolphin of the Little Bahama Bank. Between dives, passengers would occasionally swim with the Spotted dolphin as a diversion, and interest grew from there. Salvage divers had first encountered this resident group of dolphin while working treasure wrecks in the area. In 1986 Scott became captain of the 65 ft. Dream Too. By this time the focus had shifted from diving to dolphin encounters and the human/dolphin relationship began to flourish. Scott didn't initially view them as research subjects; he started to build a relationship centered around play and trust. As he began to recognize individual dolphins with distinct personalities, he started naming them and compiling an identification catalog. Over time, Scott cemented a unique bond with these dolphin. Two generations of them have literally grown up with Scott, allowing him to observe wild dolphin behavior that has never before been seen. Scott has identified and keeps track of over 100 individual Spotted dolphin, about 30 of which he can recognize on sight. Since the number of spots per animal increases with age, he must continually update his I.D. catalog. Photographs are taken of both sides of each dolphin, then logged into a database. A detailed record of each encounter is also maintained. Scott is an accomplished underwater photographer and videographer, and his relationship with the dolphin has enabled him to document a comprehensive range of behaviors. Scott and the Dream Team have played host to visitors from around the world including feature film crews, National Geographic, The Cousteau Society, many of the world's top underwater photographers, and many family yacht charters. Scott has been featured in a on-hour documentary for Japanese television, educational videos, and the subject of books and magazines worldwide. Robin has a U.S. Coast Guard 500-ton Master's License. She is also an engineer and divemaster, and has been involved with boats and the ocean most of her life. In 1981 Robin began a voyage on the Mechanic, a 60ft. sailboat, and spent the next 10 years at sea, traveling the east coast of the U.S. and throughout the Caribbean. She worked as a commercial fisherman, marine mechanic, salvage diver and island trader, eventually joining the Dream Team in 1992. Robin's years of experience gives her a wealth of information and many interesting stories she shares with the passengers and crew. One of Robin's strengths is her amazing mechanical ability - from routine maintenance to major overhauls. Her skills are diverse' she is an accomplished diesel mechanic, electrician, plumber and carpenter - all of which are essential in keeping a boat running smoothly. She can fix anything! Robin is a skilled freediver and enjoys giving tips to passengers on swimming with wild dolphins. She is a favorite of photographers, and has appeared in many magazines swimming with the dolphins. Robin also loves fishing and collecting specimens for her onboard aquarium. She even keeps a microscope on the boat for examining planktonic creatures!